Including this one, 2,060 entries. Because I was so prolific in the first few years, I’m still averaging nearly a post every other day. Chronicling my 21st year seems like such a long time ago, but I still remember sitting on that ratty blue couch in the living room. It was sweltering in that house. We had an undersized window unit in that living room. It was already kinda dirty when we moved in. The wiring was faulty to the point I’m surprised it never burst into flames. But it was our house. At the same time, it feels like only yesterday. But that couch is long gone. The new owner has been struggling to renovate that wreck of a house. This blog is still here. I just haven’t been ridiculous lately. I can’t remember the last time I jumped in my car and visited a random small town. I can’t remember the last time I jumped in my car and showed up at someone’s house just because. Oh wait, that was in February. I mean, it doesn’t happen all the time anymore. Most weeks, I get up, go to work, go home, cook dinner and then putter around the apartment until bedtime. Things are changing still, but it’s more gradual than it once was. My head is still full of ideas but I still cling to the idea that a journalist is objective. Although it is great to sit back while people are foaming at the mouth about the outrage du jour. But, at the same time, my writing overall has dried up. Sure, I write for a living, but I can’t remember the last time I banged out a short story. My drive to work on my novel died with LSWV. It’s so easy to blame my lack of writing on my laptop dying in 2013, but I can’t ignore the correlation. The overall issue is that I promised myself the novel would be the culmination of all the stories I set in that particular universe and I don’t want to reverse that decision. But I want to write. I need to write. Something. Anything. I need to get back into it. This dozen years can’t be all for naught. Rules are meant to broken. Especially if they’re your own. On Friday, I broke down and gave Amazon money for cloud storage. I got most of my music back just like that (I uploaded every song on LSWV during the trial period). A coworker was able to mine V’s hard drive and I reconciled the cloud on Sunday. Additionally, I’m able to get back to work on finishing this final revision of Brown River Blues. I don’t like extensive typing/hand writing on LSW6, but maybe Santa Claus will get me a keyboard. The jury’s still out on whether V will ride again. All I need is for it to limp into late 2014 or so. If not, I can make do with 6. Then again, I could befine with this tablet. I no longer need a full-on computer. Sure some things are more convenient on a “traditional” computer, but my only problem is that I can’t access my job’s VPN. And I don’t and shouldn’t work that extensively from home. I have a screen larger than my remote control-sized cell phone. That’s mostly what matters. Most importantly, I have my music back and only deafness, abject poverty or an electromagnetic pulse can take that from me now. So. My laptop bit the dust. From what I can figure out online, the graphics card died so it won’t boot. This is due to the wonky screen. I’m broadcasting live from my new tablet, LSW6. In theory, I can rescue my files from V . … I need to, since the (should be) final draft of Brown River Blues is there as well as my music and such. I’m sure I can recover my shizz and move on soon. On the bright side, I can handwrite my blog entries, as I don’t have a keyboard. Despite my outrageous cursive, it’s keeping up 80% of the time . I nearly said 90 but fail. As I said in my last freak out, I didn’t want to make a purchase this close to the wedding but I kinda had no choice. In remembering LSW1, holding basically a full computer in one hand whilst I handwrite something is nothing short of amazing since 1999. I hope I get a laptop for Christmas, though. 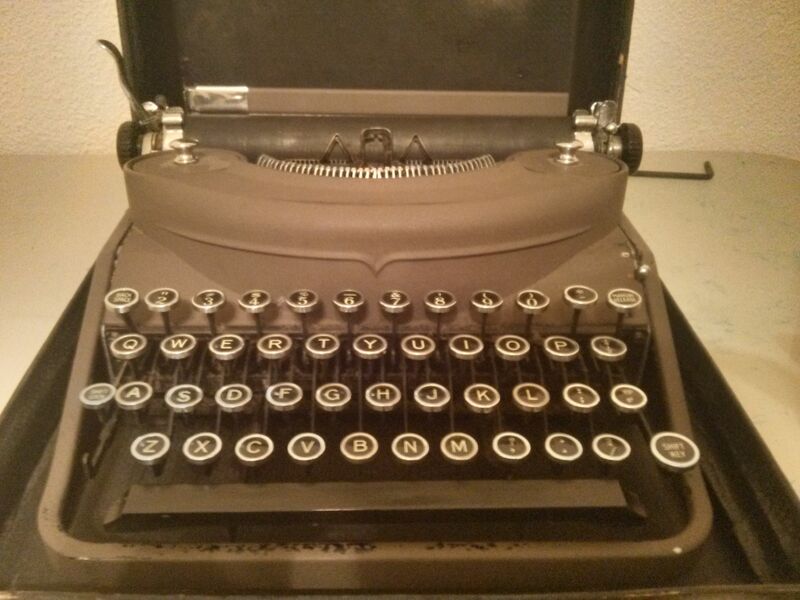 I’ve mentioned it before: This is my mother’s typewriter. She got it used in the 1960s. At that point, it was already 30 years old. I discovered recently that it is a Remington Noiseless Portable from the 1930s. It has a couple stuck keys, needs a new ribbon and a new shift key. I can get it fixed for $75 because of course Charlottesville has a typewriter repair shop. If I can figure out a way to get this on the Internet, screw this computer. Speaking of this computer, the screen has been a little off for a couple of weeks. I’m strongly considering getting a tablet, but it would make it harder to do things, like type. I guess I can always get a USB keyboard. There are typewriter-tablet mod kits but, sadly, the one that I saw isn’t compatible with this model. I could get one already done up but for the price of that and a tablet, I could get a spectacular desktop. Or an outrageous laptop that would be useless in three years. The only reason I’m leaning toward another laptop is because I still like to make CDs, mostly because I can’t jack anything into my car stereo except with an auxiliary cable. Doing an overhaul of the audio system in Nicole is on my list of things to do after the wedding. I may get a tablet anyway because I don’t want to limp along with a wonky screen for about seven months, especially if it goes beyond the colors being slightly off, artifacts and it sometimes not liking my web browser being in full screen. I could get the screen repaired, but what’s the point of dumping money into a three-year-old laptop using Windows 7? I’m not quite exaggerating the absurdity. We need to start collecting addresses and send save-the-dates like now, then the actual invites, I need to finish the wedding mini-site here, we still need a reception space and caters, I think I need to find a new wedding photographer, we still haven’t done engagement photos, there’s no music at the moment and I DON’T UNDERSTAND WHY I’M THE ONLY PERSON FREAKING OUT. This is why I was comfortable with being social chair of my fraternity chapter senior year. We once had a party that started at 10 p.m. and I had everything set up before the first person showed up to help at 6 p.m. And I told people to come around then. When we had parties at the house in Richmond, we would be ready for hours every single time. I shouldn’t have even brought this up with myself because now I’m thinking of other things we haven’t done yet. I DON’T HAVE A WEDDING HAT YET. This was supposed to be a post of me saying that I’m going to get the typewriter repaired in November because I got the crazy idea of making all of the save the dates on a roughly 80-year-old typewriter. This baby is older than World War II. I’m such a hipster sometimes.